There are certain processed, packaged foods that I simply can’t believe anyone buys. Pre-peeled garlic? Herbs in tubes? As if Pillsbury cookies weren’t easy enough they had to start selling pre-sliced ones. Then there are other foods that you always buy because it just never entered into your head that you could make them. Pasta, muesli, even cheese. Then one day you’re feeling adventurous and you try it. And it’s easy! And it tastes so much better than the store bought stuff! Then I made them for a French themed party and realized that it was easy, and they had a much better texture than store bought marshmallows. On top of that, you can flavour them however you want! How about a coffee flavoured marshmallow in your hot chocolate? With this post I’m giving you a basic marshmallow recipe to which you can add whatever flavour and colour your heart desires. You don’t even need a candy thermometer for this one, though a stand mixer comes in really handy if you don’t want your arm to be sore (or your hand mixer to blow up...). 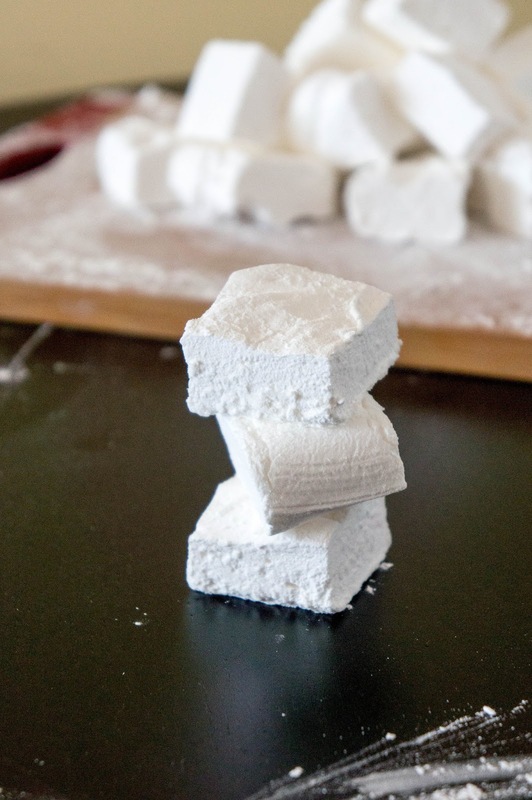 These marshmallows are dreamy, make ‘em! Grease an 8 inch square pan with some vegetable oil. Mix together corn starch and powdered sugar. Use 1/4 cup of the mixture to dust the bottom and sides of the pan, making sure all are covered. Pour 1/3 cup cold water into a large bowl or the bowl of a stand mixer. Sprinkle gelatine on top and allow to sit for 15 minutes. In the meantime, combine remaining 1/3 cup water with corn syrup, salt, and sugar in a medium saucepan over medium heat. Stir until sugar is dissolved. Stop stirring and wait for mixture to boil. As soon as it boils (ie bubbles are quickly rising to the top of the liquid), time 4 minutes. Remove from heat. Immediately start your mixer on low speed and pour sugar syrup down the side of the bowl in a thin but steady stream. Once all the syrup is in, increase speed to high and continue beating until the bowl is lukewarm, about 7-10 minutes. Add vanilla and mix until combined. Turn out the sticky, sticky mass into your prepared pan. Smooth with damp fingers. Let sit, uncovered at room temp for one hour, then dust top with another 1/4 cup of powdered sugar/cornstarch mixture. Let set overnight. 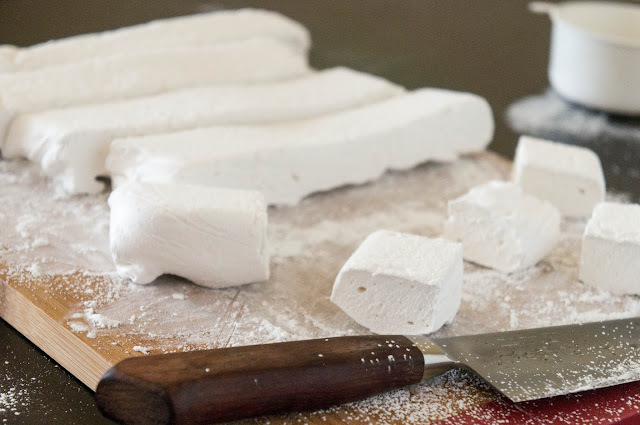 When ready to cut, sprinkle some powdered sugar/cornstarch onto a cutting board and turn your marshmallow out of the pan. 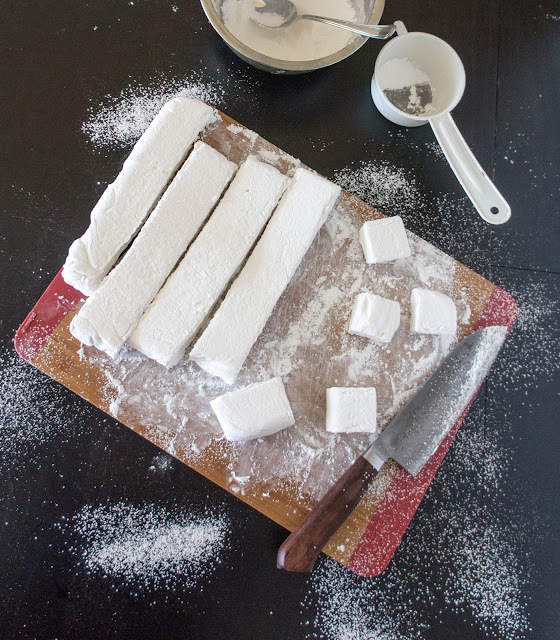 Lightly oil a sharp knife and cut marshmallows into squares. Roll each square in powdered sugar/cornstarch. 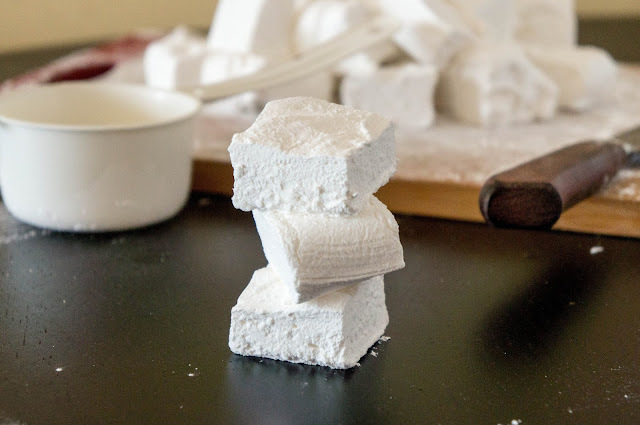 To flavour marshmallows, replace vanilla extract with a flavouring of your choice. You can also add spices like cinnamon or ginger (gingerbread marshmallows anyone?). Feel free to mix in or top with some chopped nuts or toasted coconut. I also can't see a couple tablespoons of cocoa powder or malted milk powder hurting anything... but don't quote me on that. To colour marshmallows, put a couple drops of food colouring or some gel paste colour in with the vanilla and beat until combined. For some really crazy stuff, put a couple drops of food colouring on the marshmallow after you smooth it in the pan. Then use a toothpick to quickly swirl it around the top for a marbley (marbly? marble-y?) effect. Could I do this recipe with agar agar?? If so how much would I use?? Kel, I know the vegan/gluten-free conundrum very well. It's hard to replace the crazy things eggs, gelatine, and gluten do. Though agar-agar makes a jelly-like product it does not bind with the sugar as beautifully nor is it as stable so you have to add other things as well. Mostly protein and stabilizers. Since I haven't done this myself, I refer you to this article from Serious Eats (Scroll to the "Vegan Conundrum" section). Good luck and let me know if you try it! How about maple syrup instead of corn syrup? I've made marshmallows before but I lost the recipe and then I found yours. This is about as no-fail as it gets! I whipped up two batches for a friend's birthday. One with a tsp of peppermint extract and some red gel coloring to make the marshmallows all pretty pink. The other batch was with a tsp of vanilla bean powder. (I didn't have extract on hand).